We may have had a few snowflakes in the Keweenaw this week, but we aren't about to let that dampen our spirits. We had A LOT of melting before that, so spring is surely on the way. I guess that means it's time to think about more spring decor. Maybe if I display a printable about green grass, we'll get green grass? Hey, it's worth a try! Here's one I designed in honor of the upcoming season. I gave it a slightly weathered appearance on purpose and printed mine as a 5x7. If you would like to download and print your own copy of the printable that looks like mine, click here on Spring A. If you would like a version that's a little more green and a bit less weathered, click here on Spring B. If you would like a simple black & white copy without the flourishes, click here on Spring C.
Printables are a fast, easy and inexpensive way to change up my seasonal decor. Julie - I sure do love the picture of the peninsula overlooking the water! I love water views. 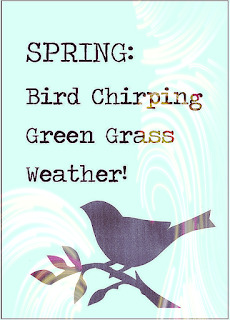 Love the printable in its different versions as well, it definitely will help spring feel like its coming sooner. You know what my eyes were drawn too in your picture? your oil lantern - I love lanterns! Love it - I am your neighbor today at Paula's weekend linking up. PS.. if you are looking for another place to link to on Thursday's I would love if you would consider joining my new linkup #TuneInThursday - it opens Thursday 3am PST and runs through Sunday night. you can find it at debbiekitterman.com/blog (Please feel free to delete the link if you think it inappropriate). Thank you, Debbie, for your sweet comment. I'll check out your link party. How cute! The perfect Spring decor and so easy too! Pinned!! Thanks for sharing on Friday Frenzy Link Party! Thanks, Kelly! Easy is the name of the game around here! Very sweet! Two of my favorite things. . .birds chirping and green grass! Thanks for sharing with SYC. I appreciate your kind remark, Jann! I love this printable. Thank you for sharing at Dishing it and Digging it link party. That's a great Spring printable. Very pretty. Oh this is cute--I love the options you gave too! So cool. Thanks for linking up to the Friday Frenzy we appreciate you! That is a lovely printable Julie. It is just what we need to brighten up our day! Pinning! I appreciate that, Mary! Thank you!